Black Bamboo is a unique pop-up cocktail bar and experience geared towards whimsical adults, showcasing the best in cold-pressed cocktails, champagne service and exceptional live entertainment. With capacity for up to 170 guests per night, with eight available tables and up to nine supreme cocktails to choose from, Black Bamboo makes for a perfect night to celebrate or simply be surrounded by your favourite people. Read on for more information about your summer/fall cocktail stop. Masterhouse is proud to host the industry preview of the Black Bamboo Experience on Thursday, June 1st. For access to our guestlist, please contact vip@masterhouse.net. Space is limited. The atmosphere promises to be different from night to night – the live music will vary genres and the cocktail list will be consistently rotating. The element of surprise will ensure your experience will be new and exciting each time you visit – including a nightly rotation of natural blended juice cocktails and craft beer. Guests will be dancing and mingling with a sophisticated yet non-intimidating setting. Black Bamboo is your perfect spot to warm up to the rest of the evening and indulge in some of the best cocktails the Vancouver nightlife scene has to offer. Our experienced local DJ’s will provide head bobbing, toe tapping beats to ensure there is never a dull moment or awkward silence. Genres will vary from downtempo and jazz to funk, disco and even hip-hop. Black Bamboo will aim to give guests a nostalgic feel from the 90’s. Black Bamboo has partnered with Aperol and Hendricks Gin to ensure we offer the utmost quality to our cocktail options. Bittered Sling Bitters has also jumped on board to provide high-quality, small-batch bitters and extracts to bring this cocktail experience full circle. Guests are encouraged to book reservations up to two weeks in advance to ensure entry, availability and no cover charge. I read this article and found it very interesting, thought it might be something for you. 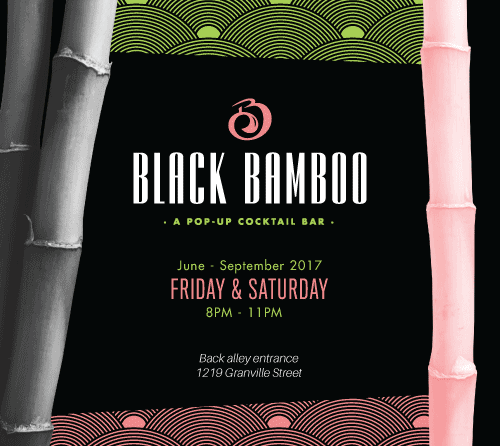 The article is called Black Bamboo Opening Weekend June 2nd & June 3rdand is located athttp://masterhouse.net/events/black-bamboo-pop-up-cocktail-experience/.